The research was conducted in Q4 calendar 2017 across the US and the UK, using SurveyMonkey™. Responses were compiled from 3000 consumers who had used a chatbot for customer service within the prior 12 months. 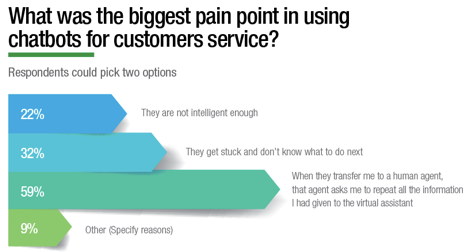 59% of respondents (62% in the US and 55% in the UK) found that having to repeat information and context to a human agent in the event of escalation from chatbots was the biggest hassle by far in using virtual assistants . Not surprisingly, this is a result of businesses taking a siloed approach to customer engagement across touch points, including chatbots. The second biggest deterrent was chatbots “getting stuck and not knowing what to do next” at 32% (29% US and 37% UK). This is a common problem that arises from a lack of focus on knowledge management to empower chatbots. 53% of the consumers surveyed (54% US and 52% UK) found chatbots to be “not effective” or only “somewhat effective”. US consumers were harsher in their assessment of chatbots with 14% rating them as not effective versus only 5% in the case of UK consumers. This is perhaps an indication that US consumers are challenging chatbots with more complex questions than UK consumers. Younger consumers thought that chatbots were more effective than older consumers with 22% of Generation Z and 15% of millennials rating them as “very effective”, and only 12% of boomers and silent generations giving it the same rating. This is due to the positive attitude that digitally-savvy younger consumers have towards chatbots. Educated consumers rated chatbots only half effective as less educated consumers-13% of respondents with undergraduate or graduate degrees rated chatbots “not effective” versus 7% of those with high school diplomas or incomplete high school education. This could be because educated consumers challenge chatbots to resolve more complex service problems.